If you're importing your content from Squarespace to Whooshkaa you want to be sure all your information transfers and that your fans are unaware that the change took place. The following process will inform Apple Podcasts (iTunes), podcast apps and any other podcast directories that you've made the change. 1. Go to Squarespace and export and save your analytics. All your other data (audio, images, show notes etc) will import to Whooshkaa. 2. Sign into your Whooshkaa Dashboard and navigate to "Shows & Episodes". Click on the "Import a Show" button. 3. Paste in your "Squarespace RSS Feed" and click "Create." Whooshkaa will then import your show. 4. Once imported, copy your new Whooshkaa RSS feed. For more details on how to do this, see this guide. 6. In the Home Menu, click Pages. 7. 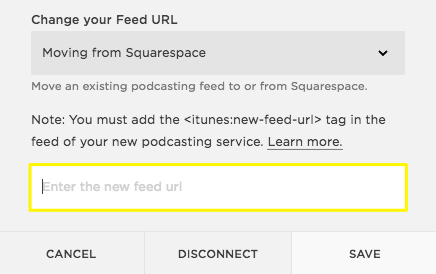 Hover over your podcasting Blog Page title, and click the next to the title to open Blog Page Settings. 8. Click the Syndication tab. 9. Under iTunes / Podcasting Setup, click Edit Settings. 10. Scroll down to Change your feed URL. 11. Select Moving from Squarespace. 12. Enter your Whooshkaa RSS feed in the box. Note: Deleting the Blog Page or cancelling your site will disable the 301 redirect. Apple recommends maintaining the 301 redirect and therefore your Squarespace Blog/Site for at least four weeks. 15. Click on your existing podcast. 16. In Whooshkaa, copy your new Whooshkaa RSS feed. For more details on how to do this, see this guide. 17. In Apple's Podcast Connect, paste your new "Whooshkaa RSS feed" in the "URL text box." Then click "Save." Apple Podcast’s will then pick up this change.